The main difference between Ascaris and earthworm is that Ascaris is a parasitic roundworm that causes illness whereas earthworm is a segmented worm beneficial to the soil. Furthermore, Ascaris belongs to the phylum Nematoda while earthworm belongs to the phylum Annelida. Ascaris and earthworm are two types of worms that belong to different phyla. The difference between Ascaris and earthworm lies in their anatomy and influence to other organisms. Ascaris is a genus of a parasitic roundworm that belongs to the phylum Nematoda. 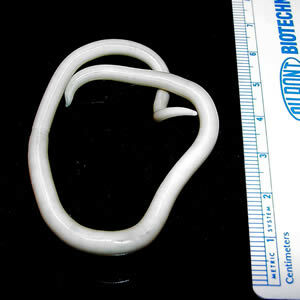 Generally, this genus is known as intestinal roundworms. Out of that, Ascaris lumbricoides, one species of Ascaris is the most common human parasite. It causes a disease called ascariasis. Significantly, Ascaris is a good example of worms with clearly visible sexual dimorphism. Here, the female individuals have a significantly longer and heavier body than their male counterpart. Also, the male individuals have a hooked end at their posterior end. Furthermore, a single female individual lays around 240,000 eggs per day. These eggs pass through the feces into the outside environment and humans can re-infect by swallowing these eggs. Earthworm is a segmented worm that belongs to the class Clitellata under the phylum Annelida. Each segment of the earthworm’s body is a repeated body unit. The anterior end of the body contains the mouth. Significantly, earthworm has a raised area with a pale color near the anterior end. And, this area is known as the clitellum. It serves as a covering in which eggs and sperms of the earthworm are deposited. Therefore, earthworms are a type of hermaphrodites. 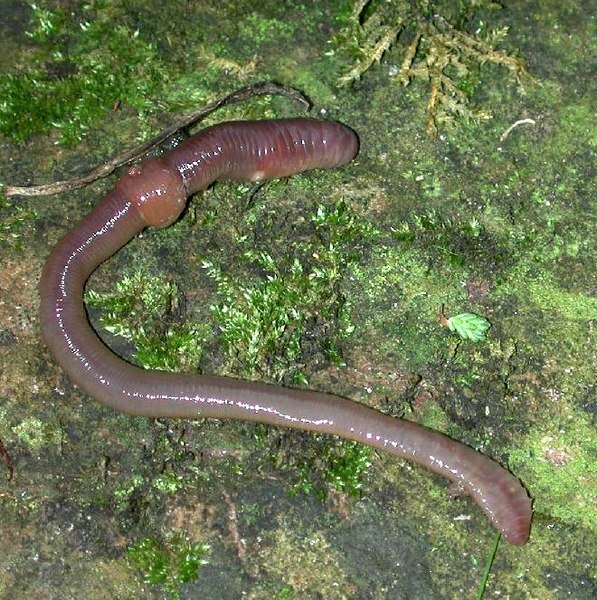 Moreover, the earthworm is considered as an important invertebrate in the soil as it changes the physical structure of the soil in order to increase the aeration. The pores created by earthworms in the soil helps to bring oxygen and water into the soil. Additionally, earthworm casts are responsible for some of the fine crumb structure of soils. Ascaris and earthworm are two types of worms that are animals with a lower body organization. Both types of worms are invertebrates with bilateral symmetry. Also, both have complete digestive systems. But, they do not have respiratory systems and their respiration occurs through the skin. Ascaris refers to a parasitic nematode worm of a family Ascaridae whose members typically live in the intestines of vertebrates while earthworm refers to a burrowing annelid worm that lives in the soil, important in aerating and draining the soil and in burying the organic matter. Thus, this is the fundamental difference between Ascaris and earthworm. Based on classification, the difference between Ascaris and earthworm is that the ascaris belongs to the phylum Nematoda while earthworm belongs to the phylum Annelida. Another major difference between Ascaris and earthworm is that Ascaris is a roundworm while earthworm is a segmented worm. Ascaris lives inside a host such an animals’ body while earthworm lives either in freshwater, saltwater or in the soil. Hence, this is another difference between Ascaris and earthworm. Moreover, the appearence of each creates another difference between Ascaris and earthworm. The ascaris is thin and smooth while earthworm has a brown, tube-like body, and moist skin. Also, the ascaris grows up to four feet log while earthworm grows up to eight feet long. 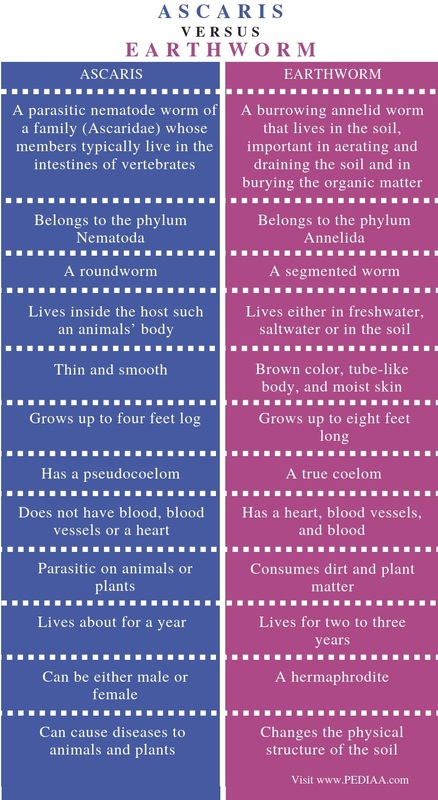 Furthermore, another difference between Ascaris and earthworm is their coelom. While ascaris has a pseudocoelom, earthworm has a true coelom. The circulatory system is also a difference between Ascaris and earthworm. Ascaris does not have blood, blood vessels or a heart while earthworm has a heart, blood vessels, and blood. Besides these, Ascaris is parasitic on animals or plants while earthworm consumes dirt and plant matter. Their lifespan is another difference between Ascaris and earthworm. Ascaris lives about for a year while earthworm lives for two to three years. Additionally, ascaris can be either male or female while earthworm is a hermaphrodite. Ascaris can cause diseases to animals and plants while earthworm changes the physical structure of the soil. Ascaris is a roundworm that belongs to the phylum Nematoda. It has a thin, unsegmented body and it is a parasitic worm. It also has a pseudocoelom. Generally, Ascaris causes diseases in their host. In contrast, earthworm is a segmented worm that lives freely in the environment. It is important in agricultural fields as it changes the physical structure of the soil in such a way to increase crop growth. However, the main difference between Ascaris and earthworm is their anatomy and importance. 1. Moore, Audrey. “Annelid vs. Ascaris.” Prezi.com, 5 June 2014, Available Here.